“I don’t like to go to class with this new instructor. I am in pain. I won’t ever come back to that class!” I heard this refrain time and time again. Sometimes it is about running. Sometimes it was about biking. Occasionally it was about walking. People would try something new and when it hurt they would whine about the pain and run away. Somehow it clicked with me a few months back. I realized that I WILL hurt. It's not really pain as much as it is discomfort (Although when I've really pushed myself it surely feels like pain...but realistically speaking it is more discomfort.) It clicked that this discomfort was good. And for some reason I embraced the pain. I embraced the fact that trying something new was going to hurt. I embraced the fact that running would hurt some days. I embraced the fact that I would hurt and on a daily basis. Somewhere, somehow in the last 100 years or so we as Americans have been brainwashed retaught the belief that pain is a bad thing. If it hurts, don't do it. What kind of mentality is that? How will you EVER succeed if you don't push yourself past a little discomfort. Our ancestors were not afraid of pain. Our forefathers sacrificed a lot to settle and survive in harsh territories. Our ancestors faced unmanageable pain when they fought for freedom. History shows that pain was a very real and very present fact of life. They didn’t run at the first sign of pain. If they had, we would not be free. Their families wouldn’t have food. Our world would not have evolved into what it is today. So where did we go wrong? I have no clue and it’s not really important. The important thing is to recognize this tendency to flee from pain. Real and true pain is something that we should be on the guard for. However, we need to recognize that what we perceive as pain is really progress. Like I said, I’ve begun to embrace pain. The beauty of pain is this……by ignoring the aches and pains that pushing my body brings, I have been able to see myself progress further than I EVER thought was possible. So how HAVE I learned to push myself past this pain. The best example is a bike ride I had the other week. I wanted to quit. Ohhh, I wanted to quit so bad. I had a mental conversation with myself. “Was I dying?” The answer was no. “Were my legs in danger of falling off of my body?” The answer was no. “So what’s the issue?” And the answer? I guess there is no issue! I pushed through it. I admit that I was sore and achy. But that ride gave me a sense of accomplishment that filled me with confidence and self satisfaction. That ride ALSO helped me gain progress in my long term bike riding goals. It was a win win. If I had quit I may not have LOST, but I certainly wouldn’t have won! I want to WIN! "Make friends with pain, and you will never be alone.~Ken Chlouber, Colorado miner and creator of the Leadville Trail 100 mile race"
yep pain hurts physically, but not bein able to do the things you lovr is a mental anguish that hurts far worse in the long run, bein able to go for a walk or tie your shoes means more than a little ache in my knees or a temporary funk. Getting back into working out recently, I am very familiar with pain! It's amazing how used to inactivity my body had become. And scary. This is so true! 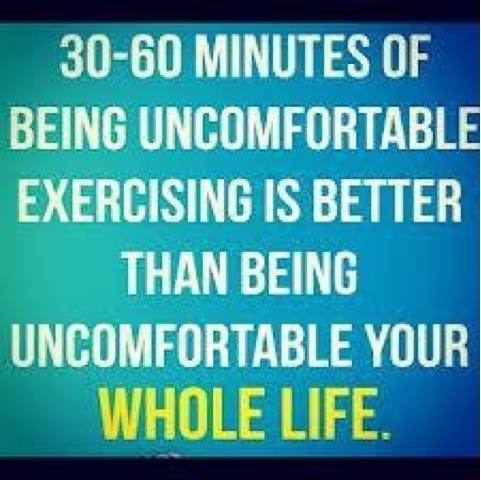 I used to be the person who ran from exercise because of discomfort...not anymore. 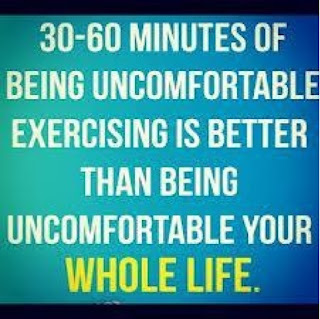 And there is a difference between discomfort and pain. I'm a big believer that "pain" is bad, but discomfort is not. Pain from exercise is the best pain!! (unless its an injury).